When Brianna Forte is made executor of the Clerkwells' estate, she thinks it'll be a simple task to catalogue and liquidate their assets. 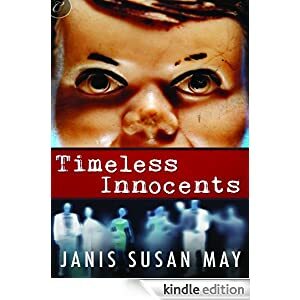 After all, they lived very modestly, their only apparent interest in life being a large collection of eerily lifelike little figurines called Timeless Innocents. This was an enjoyable book that passed away a few hours. But, that was all it was. I didn't jump, I wasn't scared--I did not show any sign I was reading a horror book. This wasn't of any fault to Janis Susan May, however, it was merely the fact that this novella was very similar to the usual movie thriller. Yes, I didn't find it to be of the horror genre because usually a lot more happens and many people die but this was a thriller because everything was more or less resolved by the end and it just kept you on your toes, waiting for something to happen throughout. The first 'horrifying' thing happened at 48% of the book. That's how slow it was. It was just dragging and talking about pointless things to do with the protagonist's personal life. We didn't need that much detail! When it got a bit 'spooky' it was relatively enjoyable, however to be able to scare someone while reading can be difficult (Mr. King is the only one who has achieved that with me) so I would think this story would be much more suited to the big screen rather than a book. The writing was excellent. There was very little errors considering it's an uncorrected proof which is always a plus. The descriptions were great and I could picture everything perfectly. I loved the little details about the main character, Brianna. Her actions and how she reacted to things said so much about her. I loved how whenever she felt a bit stressed she had a diet Dr. Pepper. The bad things about the writing: There was a little bit of telling and explaining rather than doing and illustrating here but it wasn't much of a big deal. Also, it was told in third person and was from Brianna's POV but in the middle it suddenly switched to another person's POV and at the end it switched to Brianna's boyfriend's POV which was sort of random. I think it would have flowed better without those two minor glitches. I'd recommend this book to anyone who wants a quick read but don't expect to be scared! Ah, the pov switch. That has the ability to completely ruin stories for me. Great review though!